Jumpman is a bomb disposal expert. 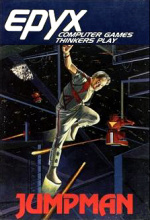 He is called on to save the Jupiter headquarters after the evil Alienators invade it and booby-trap its 30 levels. While the video game industry was crashing down around us, personal computers were beginning to invade households around the world. The Commodore 64 was one such computer and went on to become one of the most popular home computers of its time period. While Jumpman was originally programmed for the Atari 8-bit computers, the Commodore 64 version is the one most classic computer game fans still consider to be the best overall version of the game. So how does this classic computer platformer hold up all these years later on the Wii Virtual Console? The game itself is quite simple. You take control of a bomb squad officer and you're task is to run around each level disarming all of the bombs on the screen. Unfortunately there's a constant barrage of enemies and other dangerous hazards to deal along the way. The game features 30 levels, each one with its own unique set of dangers to deal with. Everything from disappearing ledges to bombs dropping from the sky, you'll no doubt have your hands full during each level. Jumpman features several different options before beginning a game. You can select from the 3 different sets of levels, which vary in difficulty, as well as how many players will be playing. Up to four players can play the game, with each player taking turns completing a level. Unlike Jumpman Jr., you can't select the speed of the game as it's basically selected for you at different points in the game, which can be both a good and bad thing. The control in Jumpman is where things get a bit tricky. Depending on the current game speed, the control can be somewhat of a hindrance at times. When the game sets the game speed at 1 or 2, everything plays quite fast. In fact it's almost too fast. This in turn makes the play control extremely touchy and makes it quite easy to accidentally walk off of a ledge or into an enemy. You disarm the bombs by merely touching them and then it's time to move on to the next one. There will be certain levels where disarming a bomb can trigger certain hazards like making enemies take chase after you or ledges disappear. This can make navigating the various level quite tricky. 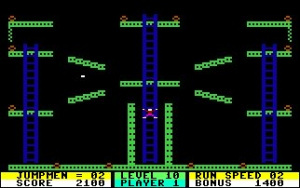 To add even more challenge the game also uses an odd play control system in which you can jump up through ledges and ladders. While this might sound strange, it works really well with how the game is laid out. It will take gamers that are not familiar with the Jumpman series awhile to come to grips with this odd control scheme, but once you get it down, you'll understand just how useful it is. The visuals in Jumpman are minimal at best, but they get the job done. Flashy visuals are not what this game is about and once you begin playing the addictive levels in the game, you won't really care what the visuals look like. Even the Jumpman character himself looks more like a stick figure than a real human being. If you've played many of the Commodore 64-era games, you'll have a good idea of what to expect with Jumpman. Much like the visuals, the music and sound effects in Jumpman don't play a huge role in the overall presentation. You'll hear some really catchy tunes before and after levels, not to mention the legendary death music, but other than a few slight sound effects here and there, there's no music to speak of during the actual levels. It's kind of a shame, considering that the few tunes found in the game are so good. There's a reason that Jumpman has become such a beloved home computer classic from the 80's and it won't take you long to find out why that is. Sure, it's not as flashy as other games from the time period and the control can seem a bit unfair at times, but when you get past these few minor inconveniences and get to the heart of the game, you'll realize that it's got one of the most addictive qualities you'll ever come across in a classic computer title. It's safe to say that if you're a Jumpman fan, you'll find that the game is still just as much fun as it ever was. And if you've never played the game, now might be a good time to see why so many classic computer fans still hold this game in such high regard. I'm gonna give this a try. The footage helped quite a bit as did this review. I can see how this game could be considered fun. Wasn't Mario called "Jumpman" at first? To answer some of the old questions.... Mario was not called Jumpman first. This was not a Mario / Donkey Kong clone... Jumpman was released January 1, 1983. Donkey Kong was released July 9, 1981. This was my very first Video game I ever played and must admit fate was strange - due to I married the creator of Jumpman.... I enjoy this game today. Yes, he is alive today.... programming and happy.